Rice needs no introduction. It is among the most consumed staple food around the world and provides over 20% of the calorific intake worldwide. Given that rice itself is so popular and important, it may come as a surprise to learn rice bran is typically discarded. And this despite being an incredibly nutritious part of the grain. Rice bran can be found just beneath the rice seed hull and is one of the four parts that make up a grain of rice. Rice bran actually contains all the minerals and other nutrients necessary for rice to grow. So why is it so often discarded? The reason is that rice bran contains an enzyme called lipase which degrades the plant’s oil rapidly making rice bran rancid. However, a stabilized form of rice bran with the lipase deactivated has a fairly long shelf-life of around six months. One of the products made from stabilized rice bran is rice bran oil. Rice bran oil is an extremely healthy option if you are looking to replace your regular cooking oils. It is a great source of amino acids, minerals and vitamins as well as Omega fatty acids. Choosing the right cooking oil can play an extremely important role in a person’s health. A good quality, healthy cooking oil like rice bran can boost the heart’s health, reduce cholesterol levels and reduce inflammation. This make it important to choose the best oil especially given that so many refined oils have been linked to heart disease and high cholesterol. More on this later but research shows that a compound called oryzanol found in rice bran oil may have a very positive effect on human health and on cholesterol and inflammation in particular. So what makes rice bran oil such an exciting new entry into the market? According to experts, there are many reasons for this. 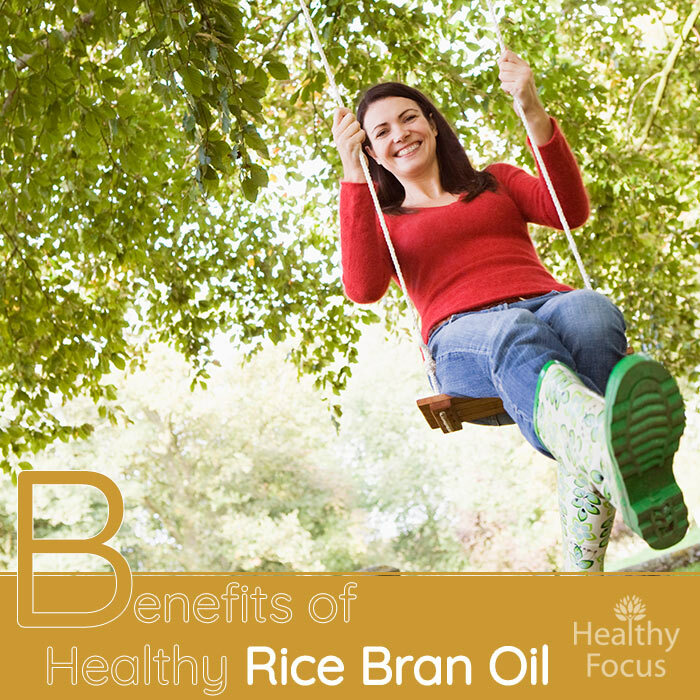 Rice bran oil has the perfect balance of monounsaturated fats and polyunsaturated fats. More specifically the ratio of polyunsaturated fat and monounsaturated fats is nearly 1:1. It contains around four times more Omega-3 and 6 fatty acid compared with other types of vegetable oil. It is made from rice bran making it rich in many nutrients like Vitamin E and many other powerful antioxidants. Oryzanol – an antioxidant compound found in rice bran has been receiving plenty of attention and studies into its health benefits have been very promising. Research into the benefits of rice bran oil and oryzanol in particular has revealed plenty of promise especially with regard to reducing cholesterol and its benefits on the skin. If you are looking for a good, healthy cooking oil to replace your normal vegetable oil, consider the following health benefits of rice bran oil. According to recent studies, rice bran oil can have a very positive impact on a person’s cholesterol levels. Studies done to date that have been conducted on humans and animals have demonstrated that rice bran oil can have a very positive impact on cholesterol. A meta analysis of the studies done so far on the cholesterol reducing effects of rice bran oil looked at 11 eligible studies. The review which was published in 2016 concluded that rice bran oil had a significant positive effect on both total cholesterol and LDL cholesterol. Heart disease is on of the world’s major killers and the increasing consumption of unhealthy vegetable oils means there is no signs of this changing. Rice bran oil offers a heart healthy alternative to more popular vegetable oils and promises to protect the heart by reducing cholesterol. High cholesterol is a major risk factor in heart disease and rice bran oil can help lower cholesterol. Moreover, the oryzanol found in rice bran oil may protect against atherosclerosis. Switching from an unhealthy vegetable oil to a much healthier option like rice bran oil may potentially reduce your risk of getting cancer in the future. Rice bran oil contains compounds called tocotyenols and tocopherols which can prevent the oxidative stress which damages the cells and DNA. Scientists speculate that the free radical fighting actions of these compounds may reduce the risk of developing cancer. Rice bran oil is a great source of varied antioxidants which can help protect us from free radical damage keeping the body in great shape. We are bombarded by free radicals every day whether in the environment, the food we eat or the chemicals we use, free radicals are impossible to avoid. To neutralize the damaging effect they have on our health, it is important to consume as many antioxidants as possible. Fresh fruit, herbs and vegetables are all wonderful sources but consider using antioxidant rich rice bran oil too. As well as using rice bran oil for your cooking, you can apply it topically to take care of your skin. It contains compounds like squalene and is rich in antioxidants that help prevent many of the signs of aging like wrinkles and age spots. It also helps to nourish and moisturize the skin. Applying rice bran oil to exposed areas of skin before going out on a hot day can keep your skin moist and help prevent sun damage. We have already talked about oryzanol in relation to its proven effects on heart health and cholesterol in particular. The same compound found in rice bran oil may also help to prevent many of the common symptoms of menopause. Studies have demonstrated that oryzanol helped significantly reduce hot flashes , night sweats and other symptoms related to menopause. The esters and ferulic acid present in rice bran oil give it anther surprising application – it can help to stimulate hair growth. Not only that, but this oil rich in omega-3 and 6 oils and antioxidants can really help to nourish the hair keeping it healthy and strong. You can use the oil as a type of hot oil hair treatment which will keep your hair in great shape and mat even help it grow longer and stronger. If you are struggling with your weight, switching to this nutritious cooking oil from your regular vegetable oil can make a big difference in the long-term. It does not contain trans fatty acid and is also cholesterol free. When compared to other vegetable oils, it contains lower levels of saturated fats. While nobody is going to suggest that simply switching cooking oils is a magic weight loss method, it can have a very positive effect on your health and over time you may start to see the weight come off. For greater effects, why not incorporate this healthy new oil into your diet and exercise plan? When all is said and done, rice bran oil is a very healthy option in the kitchen. It can help protect your heat, ward off illness and can even help improve your appearance. There is good reason why this oil is taking the market by storm. Give it a go and let us know what you think.